If you are in the market for auto insurance, you may be aware of just how competitive the industry is. There are literally dozens of different companies that are interested in obtaining your business. While sorting through all of these different companies can be confusing and even a bit overwhelming, the competition is actually good for you because it helps to drive down the prices. With the help of American Car Quotes, you can streamline this process and obtain the very best deals possible. When you take advantage of the services being offered by American Car Quotes, you also do not have to worry about hunting down the insurance companies. We have already taken care of that for you! We have determined which companies are leaders in the industry and have narrowed down your choices accordingly. Then, with the information you provide us with, we can determine which are best suited to you and we pass your contact information along. That way, all you need to do is sit back and wait for them to contact you. Don't worry, you aren't going to be contacted by these companies with their mass marketing campaigns - no one needs more junk mail to throw away. Rather, they will take the information that you provided in order to send you a quote that is specific to your needs. As the quotes start to pour in, you can compare each of them and determine which one is right for you. Many years ago, the only way to compare the prices of various insurance companies was to complete a separate form for each company and to answer all of their personal questions. This process was quite time consuming and could be frustrating when all of this time spent resulted in being told the company could not cover you or in finding out that they wanted way too much money. When you take advantage of the services offered by American Car Quotes, you will only need to fill out one form and you will only have to do it one time. We then take the information that you provide and send it to those companies that match your needs. Therefore, you don’t have to worry about filling out multiple forms and you don’t have to worry about wasting your time with insurance companies that can't meet your needs. 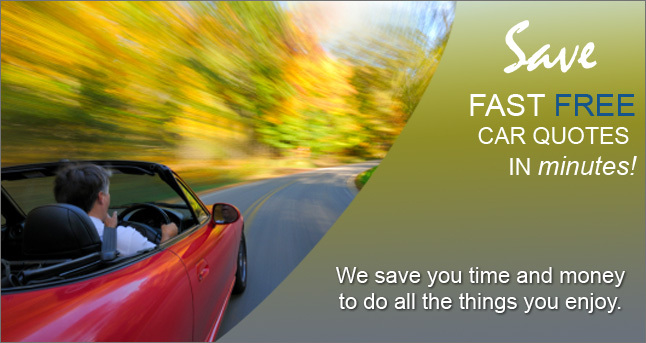 Of course, our site isn’t all about trying to match drivers up with different insurance companies. Rather, we want you to make the best decisions possible – and, the only way you can do that is to be informed. Therefore, as you browse through our site, you will find that we offer a great deal of information and advice that will help you choose the type of coverage you need and who you will purchase it from – that is just our way of providing you with the best service we can. If you are ready to start learning more about the great insurance companies that are available to you and about the rates these companies can offer, take a moment to fill out our simple online form. This form asks a few simple questions that will take you less than 15 minutes to complete – and, you only have to fill it out once! After you have completed the form, we will gather you information and forward it to the appropriate insurance agencies. They will then form a quote for you and contact you through various methods – including email, standard mail, fax, telephone, or whatever you prefer. It really is that easy! Can I get a discount for being female? What if I have a poor driving record? What is Pay as You Drive (PAYD)? What does liability insurance mean? Can I get insurance as a student? Do I need insurance for my company van? What type of insurance do I need as a truck driver?